Sony SAB Tv is famous for the Family Comedy shows. Presently SAB Tv is already running some most popular comedy shows of India i.e Tarak Mehta Ka Oolta Chasma,Chidiyaghar,Yam Hai Hum,Baalveer etc. Now SAB Tv is back with his weekend Comedy show "Rukawat Ke Liye Khed Hai" .This new comedy show of SAB Tv is produced by Kosmik Global Media Pvt. Ltd. This Show is Like a reality show in which Show Host move around different cities and Make People fool with his different tasks and Tactics. Rukawat Ke Liye Khed Hai is a show is all about making people fool with different tricks. Karan Singmar Actor of Channel "V" Show "Gumrah" is Hosting this new Comedy show of SAB Tv. 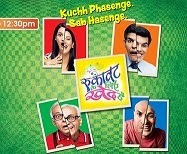 Promo of the Show Rukawat Ke Liye Khed Hai is already running on SAB Tv. After watching the Promo of the Show i can assure you . You will enjoy this show a-lot. Show is Launching on 26th,April,2015 on SAB Tv. The Show will be aired on weekends. You can watch this show on Sunday at 12:30 Pm. Repeat Telecast of the show at 07:30pm. Production :- Kosmik Global Media Pvt. Ltd.